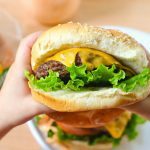 One of our best cheeseburger recipes! We love everything about this amazing burger recipe from the caramelized onions and mushrooms to the sauce! Heat up a large cast iron pan. Shape meat into four patties and place onto cast iron pan. Season beef patties with salt and pepper. Cook on both sides until desired doneness (we like well done, about 8-10 minutes per side). Preheat oven to 400 and place the mushrooms and onions with coconut oil onto a baking sheet. Sprinkle with salt and pepper and cook for 15 minutes or until caramelized. Once the burgers are done, cover them with cheddar cheese. Place lettuce, tomato, burger, mayo, and caramelized mushrooms and onions onto bottom bun. Top with other side of bun and enjoy! Nutrition information does not include bread.